Chhattisgarh Chief Minister Raman Singh says "frustrated Maoists" are losing their footholds due to the joint actions of the state and central governments which have put the state on the path of development by building roads, schools and hospitals in remote, inaccessible areas that were earlier the hotbeds of left-wing extremist militias. The longest-serving Chief Minister of the Bharatiya Janata Party (BJP) also said that Naxalism can only be countered through development and that there would be "no dearth of money" in this regard as long as Narendra Modi is the Prime Minister. 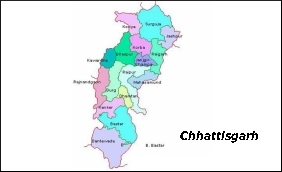 "My dream for the state is a peaceful and progressive Chhattisgarh. We are on that path. We will soon end the menace of Naxalism from its roots. We are progressing in that direction," Singh told IANS in an interview here. Asserting that development is the "mool mantra" (basic principle) of the BJP government, he said, "By carrying out development works, we have been successful in awakening society. It will definitely benefit us. "Naxalism can only be countered by development. Wherever we are constructing roads and working on development, the Maoists are losing their foothold. Now, we have reached very close and are moving ahead in an important direction to root out the menace." The Chief Minister said that his government was getting better cooperation from the Centre on the Maoist front, especially after the BJP came to power in 2014, and has been working in close coordination with it. "We are getting all sorts of support from Prime Minister Modi and Home Minister Rajnath Singh. The Prime Minister's priority has always been the development of the Maoist-affected areas. He recently provided a special fund of Rs 600 crore for the aspirational districts of the country among which seven districts are from Chhattisgarh. He provided the District Mineral Foundation (DMF) to us and we got Rs 300 crore additional funds for the state. There is no dearth of money for development as long as BJP is there at the Centre," he said. Singh said there are still many backward districts in Chhattisgarh, including Dantewada, Bijapur and Sukma. "They all are areas with heavy Maoist presence. We brought these areas into the mainstream on a priority basis. We developed these areas as educational hubs where over 4,000 students are studying. We have built many hospitals, providing them modern equipment, and deputed well-educated and qualified doctors to bring development to the doorsteps of the people of these areas," he said. Singh, who is seeking a fourth consecutive term in office, said that his government has constructed roads into those areas where it was impossible to reach. "We are connecting the whole state with four-five lane roads. Many such projects have been completed while some are on the verge of completion. We have done our best to provide high-quality infrastructure. During my visits to such areas, I find people's level of satisfaction has improved. Earlier, Chhattisgarh was rated among the most backward states; now we are counted among the fast-developing states," Singh said. Dubbing Maoists as anti-development, the Chief Minister said that the Sukma district of the state has become international headquarters of Maoists as it is surrounded by Andhra Pradesh and Telangana. "A major group of Maoists from Andhra Pradesh and Telangana are active in Chhattisgarh. They are using their entire power in Chhattisgarh as they are fighting for their their survival," he said.